These small copper stud earrings are each on a stamped silver loop with silver hooks. The historic copper comes from the roof of the Kansas State Capitol. Replaced in 2013, the copper was made available to the Kansas Historical Society and Kansas Historical Foundation for use in products to be sold in the Capitol Store. 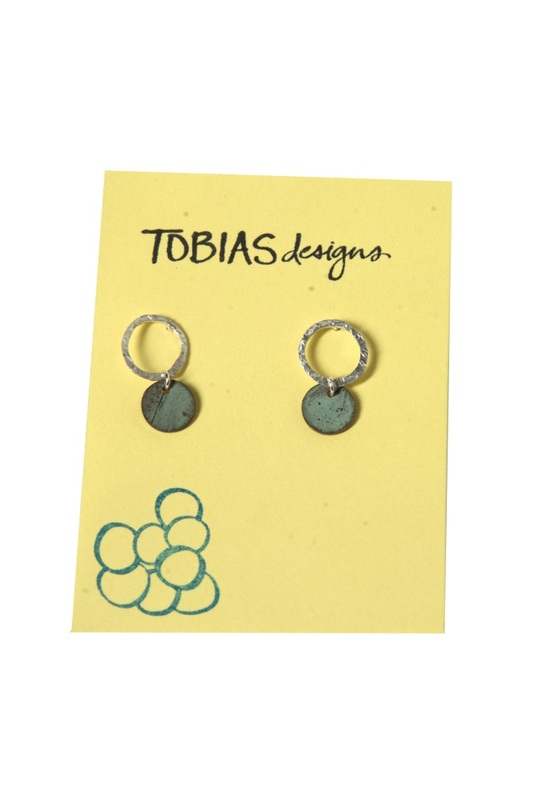 By Tobias Jewelry Designs of Topeka, Kansas. from nature, raw materials, and her rambunctious children. She has lived in Kansas for most of her life; she graduated from the University of Kansas in 2009. Britta has been a Capitol copper artist since 2013, using recycled pieces of copper from the original Capitol roof to create unique, wearable items. Tobias Designs was awarded the Kansas City Accessory Designer of the Year in 2013 and continues to inspire beauty as her work is currently showcased in states across the Midwest.